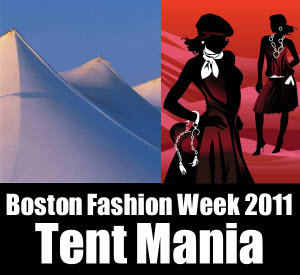 The official start of Boston Fashion Week for 2011 is tomorrow September 23rd. We were ready to update everyone on the return of this event but were sidetracked this morning by somewhat amusing articles by both the Boston Globe and The Boston Herald about the initial use of a professional tent for the runway type events. Apparently there has been some issue with the lack of a “New York” type tent for the event. Let’s face it anyone from Boston is going to flinch when we are told that we should be more like New York. Sadly though in this case the advised change is good because the increased level of professionalism and uniformity for the events has apparently been an issue in the past. The location is also more centralized in what can be considered the more fashion oriented area of the City of Boston. The tent will be between the Prudential Center and the upscale Mandarin Hotel in the Copley Square Area.